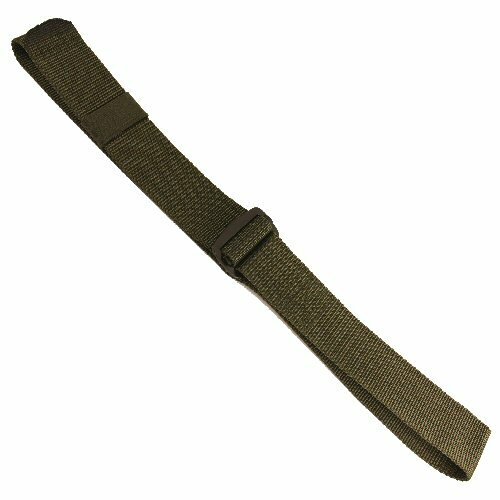 The new type 45mm wide US BDU trouser belt is available in Foliage Green to go with Army ACU, Olive Drab and Coyote Tan. The belt is made from extra heavy duty Cordura webbing which gives excellent stability in one layer. The belt will fit up to a 106cm or approximately 42 inch waist. The belt is adjusted and held tight by means of a self tensioning metal slide made from heavy duty 2mm thick steel. The loose end is then strapped in place by means of the matching colour elastic loop. This very simple design has the advantage of being self tensioning, able to move with the wearer without coming loose and being lower in profile to all trouser belts apart from velcro belts. Once tensioned, it is also silent. The belt can be used to carry leg mounted sub loads if desired. The metal self-tensioning slide is triple stitched in place with nylon cord. The US BDU trouser belt is a very popular item for use with combat fatigues, tactical wear and field clothing because of its versatility and durability. This is the olive belt.